The futuristic world of driverless cars is no longer ahead of its time when it comes to commercial property, with developers shifting into high gear on working the vehicles into their latest projects across the country. The adoption of the technologies and project planning has widespread implications for real estate values. 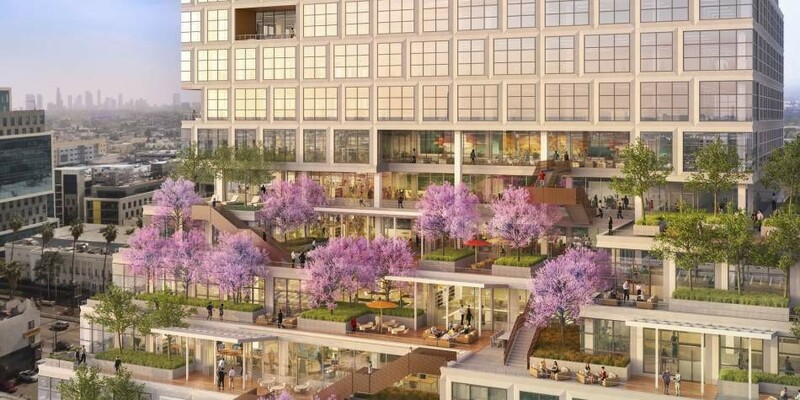 In Reston, Virginia, Brookfield Properties is deploying driverless, four-passenger cars to shuttle tenants around Halley Rise – a new $1.4 billion, 36-acre development with 3.5 million square feet of housing, retail, and offices . Brookfield teamed up with Optimus Ride, a Boston-based self-driving vehicle technology company, which also has deployed its vehicles at the Brooklyn Navy Yard , a 300-acre modern industrial park in New York with more than 400 manufacturing businesses, and Paradise Valley Estates , a private 80-acre, senior community in Fairfield, California. In Los Angeles, Hudson Pacific Properties’ 13-story, 300,000-square-foot office-retail project under construction in Hollywood that will soon serve as the headquarters of Netflix features two floors of parking designed for a different future. The flexible parking levels are being constructed with ceiling heights typical for office use. As the need for parking dwindles, that parking space can be easily converted into new office space. The building also features a dedicated rideshare and autonomous vehicle drop-off spaces and a drone landing pad for deliveries. Elsewhere, parking garages are being converted to offices and multifamily housing and parking lots are getting remade into new retail-entertainment venues as developers are already adjusting for slackening demand for parking with the popularity of ridesharing. Not the least among the examples is just how big the industry itself has already become. Venture capital firms have invested more than $100 billion so far, according to Woodside Capital Partners. Centered on the technology hubs in Silicon Valley and San Francisco, private and publicly held companies developing autonomous vehicle technology occupy more than 16.6 million square feet of office and flex industrial space in the state, according to CoStar tenant records. Wes Guckert, president and chief executive of The Traffic Group, a Baltimore-based traffic engineering and transportation-planning firm, said the fledgling industry’s impact on real estate is only beginning. The impact is showing up in stronger force in parking lots and garages. Parking demand is already starting to drop dramatically, Guckert said. Retail developers are finding that even at the peak Christmas shopping time, parking use is dropping to fewer than four spaces per thousand square feet of mall space. Many malls currently provide five to 5.5 spaces per thousand. “For developers, that creates an opportunity to redevelop unused parking areas. You can reduce parking by 25 or 30 acres when you start to look into the future,” Guckert said. Topgolf is a prime example of the sort of company that can make new use of that land, he said. The Dallas-based company’s multi-level entertainment complexes span 55,000 to 65,000 square feet, spread out on 10 to 15 acres. With the opening in Myrtle Beach , South Carolina, last month, it has grown to 53 U.S. venues. Publicly traded EPR Properties Trust spent $7.7 million on a Topgolf development in the quarter ended June 30, 2016, and the tenant made up 8 percent of the real estate investment trust’s revenue. In its most recent quarter, that spending jumped to $28.7 million and Topgolf now makes up 10.3 percent of revenue. “By combining an interactive entertainment and food and beverage experience with a long-lived recreational activity, we believe Topgolf provides an innovative, enjoyable and repeatable customer experience. We expect to continue to pursue opportunities related to golf entertainment complexes,” EPR noted in its latest annual report. Topgolf said it plans to roll out a new smaller venue that will expand its ability to serve smaller markets. The company is actively seeking and evaluating development opportunities nationwide, with a focus on markets that have populations of 100,000 to 500,000. Last month, Cushman & Wakefield released a report saying real estate from manufacturing centers to offices will have to adapt to emerging mobility technologies. Assembly plants are already undergoing high-level design changes, including higher ceiling heights, wider column spacing and greater ventilation, the company’s report noted. Within the next decade, changes may come to industrial businesses, including the relocation of large warehouses and distribution centers to suburban and/or less costly neighborhoods. With respect to urban offices, more dedicated waiting areas and/or bikeshare/scooter docks, as well as dedicated parcel delivery zones to improve lobby traffic may be on the way, it said. Brookfield Properties published its own study on the impacts in late 2017. Transportation-related implications will vary regionally, the company noted. Some locations will get larger shifts in real estate valuation premiums than others, driven by population densities, as well as the sophistication and layout of current public transportation infrastructure, Brookfield noted. Locations that are less likely to see an impact are densely populated cities with sophisticated, mostly underground transit systems such as New York. Benefits of autonomous fleets will be less pronounced in these areas because of space constraints and viable alternatives of advanced public transportation systems. The biggest effects may come in medium-density cities served by significant above-ground fixed transportation networks and/or light-rail transit systems such as Boston, Chicago and San Francisco.